Industrial Finishing Services | CT | MA | Pauway Corp. Since 1979, Pauway Corporation has earned a reputation as a quality provider of industrial painting, powder coating and screen printing services to diverse industries including Aerospace & Defense, Firearms, Electronic, Medical Device, and OEM throughout New England and nation wide. 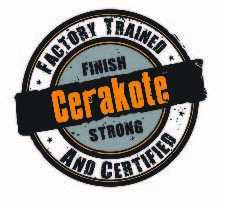 Pauway proudly now offering Cerakote coatings! 10/16/18 - Pauway is pleased to announce the we have successfully completed our AS9100D & ISO9001:2015 re-certification. Please click on the downloads tab for a copy of our update certification. 04/11/18 - Please visit us at the Design to Part (D2P) Show in Secaucus, NJ. April 18 & 19, Booth #224. Hope to see you there! 05/02/17 - Pauway Corp, is awarded Nadcap Merritt for Chemical Processing. Read the article here. 08/31/16 - Pauway will be exhibiting at ACM's Work Force Fair & Trade Show on Nov. 9th 2016. Come and see what this great organization is all about! 03/15/16 - Pauway Corp., is proud to announce our sponsorship of autismfamiliesct.org Please join us by purchasing your tickets at the above link. See you April 2nd! 08/22/15 - Please visit us @D2P in Marlborough, MA 10/01/15 - 10/02/15/ Booth #316. Hope to see you there! 06/20/15 - Pauway Corp. is please to announce that we have obtained Nadcap Accredidation for Chemical Processing. Contact us today for further details. Visit us at Eastec May 12-14 2015 Booth 5549. Check out http://www.pauwaycorp.com/trade-show-schedule.html for more details. 2/8/14 - Thanks for visiting the website! Please also check out www.ctlaserengraving.com for all of your part marking and decorating needs! Merry Christmas & Happy Holidays from Pauway Corp! May we all have a safe and prosperous 2013! 7 Aug 2012 - Thanks for checking out our new website! We are still in the process of de-bugging a bit, so feel free to leave comments or suggestions on our contact page. 12 Nov 2011 - Today, our company has expanded to meet the needs of wood finishing in Connecticut, ideally suited for custom cabinetry and furniture applications.